The idea of castrating a pre-adolescent singer to create an extraordinary voice type is horrifying and unthinkable. But in earlier centuries, these men, with their voices frozen in treble mode, were celebrated in Italy, and none was more famous than Carlo Broschi, known as Farinelli. To celebrate the 20th anniversary of the early music ensemble Les Talens Lyriques in 2011, the conductor Christophe Rousset led the Swedish mezzo-soprano Ann Hallenberg in a recital of music written for Farinelli by Handel, Geminiano Giacomelli, Johann Adolf Hasse, Leonardo Leo, the singer’s brother Riccardo Broschi and his patron Nicola Porpora. It joined similar Farinelli or castrato-themed recordings by Vivica Genaux, Philippe Jaroussky, Cecilia Bartoli and others. The soundtrack of Gérard Corbiau’s highly fanciful 1994 film on Farinelli’s life digitally blended the singing of a male countertenor and a soprano to approximate the sound of the castrato. Contemporary accounts speak of the sweetness and power of the castratos’ tone, though the only recorded evidence was left by Alessandro Moreschi, a castrato who sang soprano in the Sistine Chapel Choir until 1914, and who no one claimed was the equal of his legendary antecedents. Moreschi sounds, if anything, most like a treble: pale in timbre, mostly devoid of vibrato and occasionally unstable — just on steroids in terms of breath support and volume. Farinelli, in keeping with the style of the day, could certainly toss off melismatic passages with ease and added ornamentation in slow arias, something reflected in the music written for his voice. 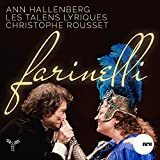 Even in this live performance, Hallenberg has relatively few bumps along the way in the long streams of running notes of the fast arias, and her ornamentation and cadenzas are florid and thrilling. The long-breathed vibrato sound is silky and refined, as in the aria “Alto Giove” from Porpora’s “Polifemo.” The only downsides are the normal artifacts of live performance caught by the microphones, such as noisy page turns, audience noises and Rousset’s sharp exhalations at opening downbeats.